A group of people gathered at a homestead, tightly surrounding either a sacrificial animal or a person. 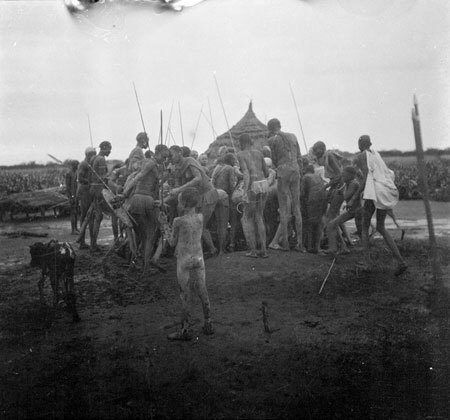 The group are mostly standing on the earthern mound of the homestead's riek shrine, the altar of God and spirits within the home, although the forked post is not visible. The crowding around of people in this way bears a striking resemblance to Evans-Pritchard's description of a scene he witnessed at a ceremony in 1936, in which a leopard-skin priest sacrificed an ox to appease two groups after the death of a Lual man some years after an accident involving the fishing spear of a man from the Jikul clan. Morton, Chris. "Nuer homestead ritual" Southern Sudan Project (in development). 03 Jan. 2006. Pitt Rivers Museum. <http://southernsudan.prm.ox.ac.uk/details/1998.346.221/>.